I arranged the hexagons randomly on a white block and then sketched the tree trunks and branches in between with pencil. 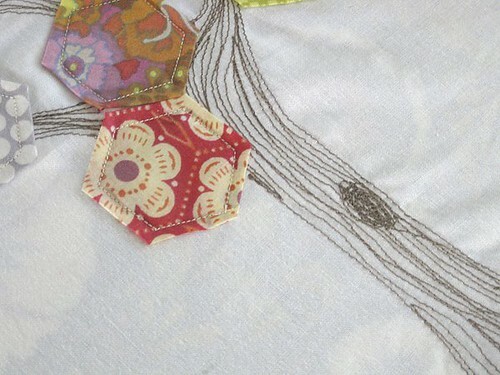 Then, I removed the hexagons and machine stitched the outline of the trunk and branches in medium brown thread. 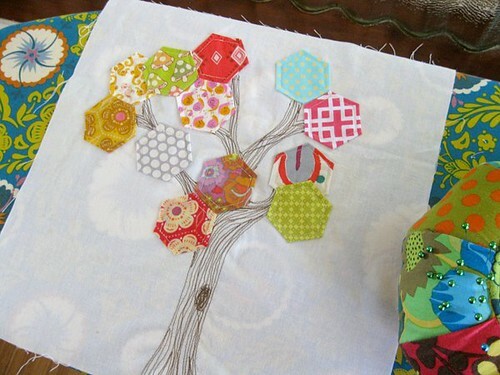 The idea to fill in the tree with free-form stitching came from Meg’s book “Sew Liberated“. She makes some cool tree pillows with trunks like these. Meg suggested free motion stitching using a stabilizer fabric underneath. After some trial and error, I decided not to mess with stabilizer or free motion. I stitched this with a simple clear presser foot. It was quick and fun! Last I machine appliqued the hexagons in place. 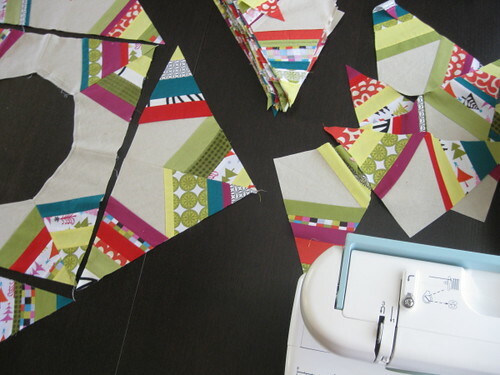 But, guess what, I need to make TWO blocks! Hmm… what to do next? * My Anna Maria Horner skirt – it only needs hemming! * The do. 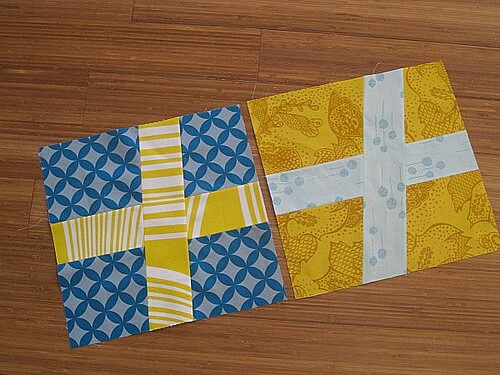 Good Stitches Red & Aqua Sampler charity quilt – just received my Kona snow from Sew Fresh Fabrics for the backing. * My Christmas Tree skirt – I’m done piecing the top (and WOW!). Now, should I bind it or just sew right sides together and turn right side out? Of course, I didn’t work on any of those projects last night. Nope. I decided to indulge in a quick finish, a one-night stand as it were. These cross blocks are for another do. Good Stitches quilt, this time for the faith circle. Ahhhh, so easy! Tutorial here. P.S. Speaking of finishes, look what my 5-year-old just finished! 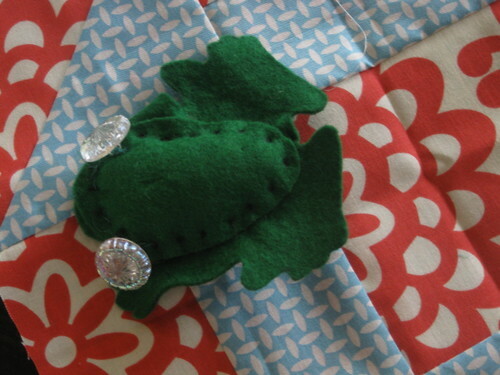 It’s a little froggie pincushion. She wanted me to share it with you :).